A smaller entry of sheep at Markethill on Wednesday 25th April sold in a firmer trade. Fat hoggets sold to a top of 463p per kilo for 22.7 kilos at £105 each with heavier lots selling up to £130 each. Several pens from £115 to £122 each. Top price for heavies 458p per kilo for 24 kilos at £110 each followed by 444p per kilo for 38 hoggets 25.9 kilos at £115 each. An increased entry of spring lambs sold to a top of 591p for 22 kilos at £130 each followed by 587p for 22.5 kilos at £132 each. Main demand from 530p to 576p per kilo for good quality springs. 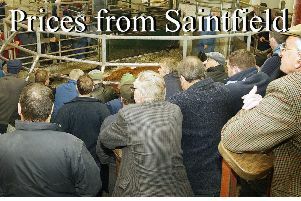 A large entry of cull ewes sold to a top of £125 each. Main demand from £90 to £115 each with second quality from £60 to £80 each. A very large entry of ewes and lambs sold in the best trade so far this year. Good quality doubles reached £278 each with other doubles selling at £275, £270 and £252 each. Main demand from £190 to £240 each. Singles sold to a top of £212 each with several more singles from £160 to £198 each. Poyntzpass farmer: 22.7k, £105, 463p; Tullyglush farmer: 24k, £110, 458p; Mowhan farmer: 24k, £110, 458; Newry farmer: 25.9k, £115, 444p; Tandragee farmer: 26k, £115, 442p; Armagh farmer: 21.9k, £96.50, 441p; Armagh farmer: 27k, £118, 437p; Glenanne farmer: 24k, £100, 417p; Newry farmer: 20k, £86, 430p and Loughgall farmer: 23.1k, £99, 429p. Newtownhamilton farmer: 22k, £130, 591p; Collone farmer: 22.5k, £132, 587p; Middletown farmer: 22.3k, £128.50, 576p; Armagh farmer: 22k, £126, 573p; Poyntzpass farmer: 24k, £137, 571p; Killylea farmer: 19k, £107, 563p; Collone farmer: 21.4k, £120, 561p; Poyntzpass farmer: 19k, £105, 553p; Newry farmer: 19.5k, £107, 549p and Portadown farmer: 22k, £120, 545p.